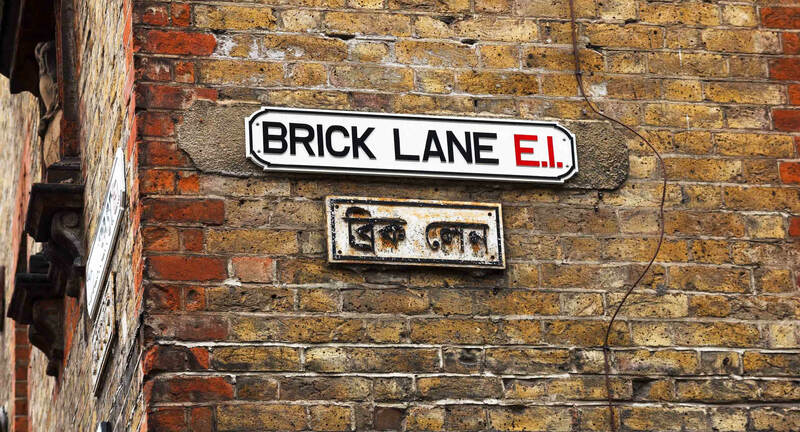 Wander down Brick Lane any Sunday and you'll find Mark Gevaux. 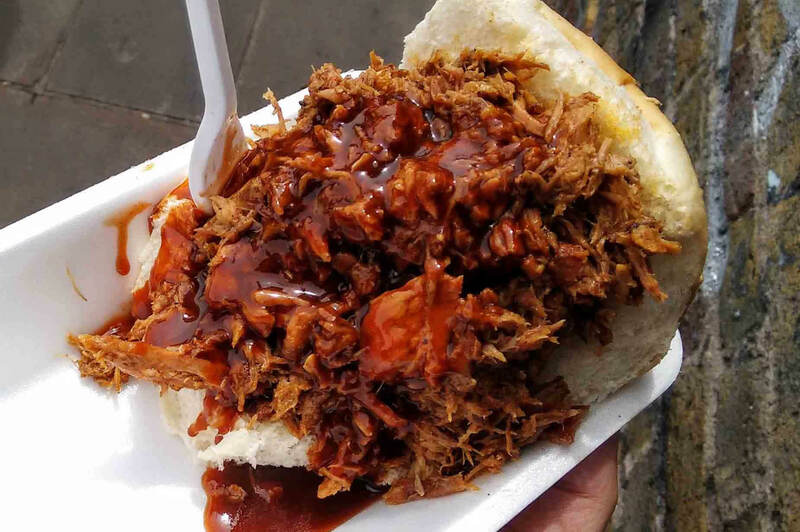 Follow your nose to the middle of the market and he'll be there - stood behind hulking ceramic barbeques and serving rib-filled rolls covered in some of the best hot sauce you'll find in the UK. A butcher since the age of 15, Mark knows his meat. Starting a stall after losing a leg in a horrific car accident, the original idea was to sell racks of ribs and spice rubs at farmer's markets until a passing baker offered to supply him with rolls. 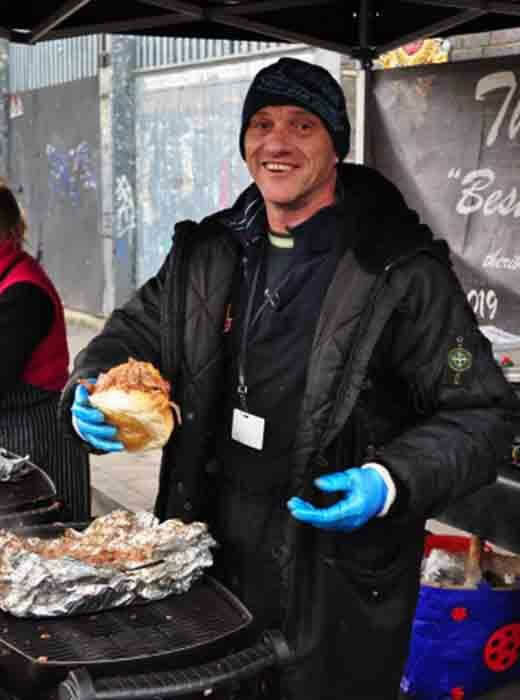 He's been selling filled rolls ever since, both down at Brick Lane and outside his beloved West Ham on game days. While his ribs take some beating, Mark might be even more famous for his line of hot sauces. Looking for a suitable complement to his ribs, his first (and mildest sauce) was made from Scotch bonnet and naga chillies. Like all his sauces, it's certainly not for the faint of heart. Always named after the reaction from the first person to taste the sauce; 'Holy F***' was followed up by two even hotter additions; 'Holy Mother of God' and 'Christ on a Bike'. Such is the demand for these challenging yet undeniably delicious hot sauces, all three can now be found in well-known London eateries such as Meat Mission, Hawksmoor and the Hix Restaurant. We talked to Mark about his business, his amazing workspace and why you shouldn't be too surprised to see him on a Jamaican beach in the near future. Why did you decide to base your business on ribs? I often get asked "why ribs?". The simple answer is that back in the day when I was a butcher we used to take home staff meat. This was usually the meat left at the end of the day - things like ribs, pork belly and lamb scrags were all butchers cuts - so it just made sense to start from there. 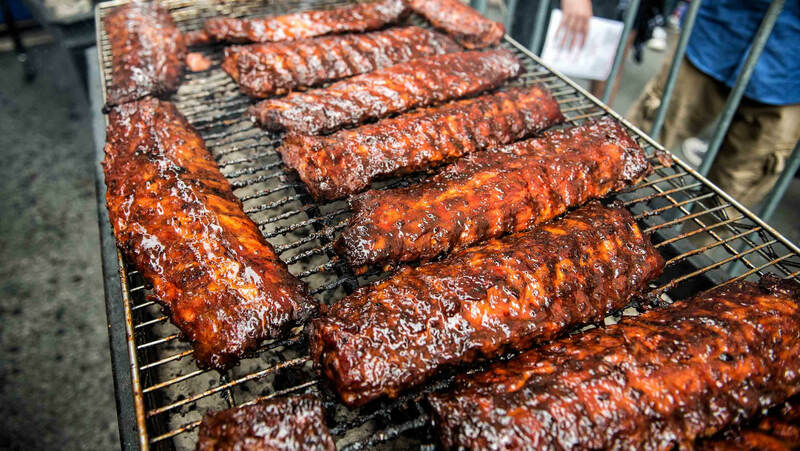 Today, of course, things are different and ribs are very much a thing. How did you end up making hot sauces? I started making a hot sauce because the ribs needed something and I do love a bit of heat in my food. 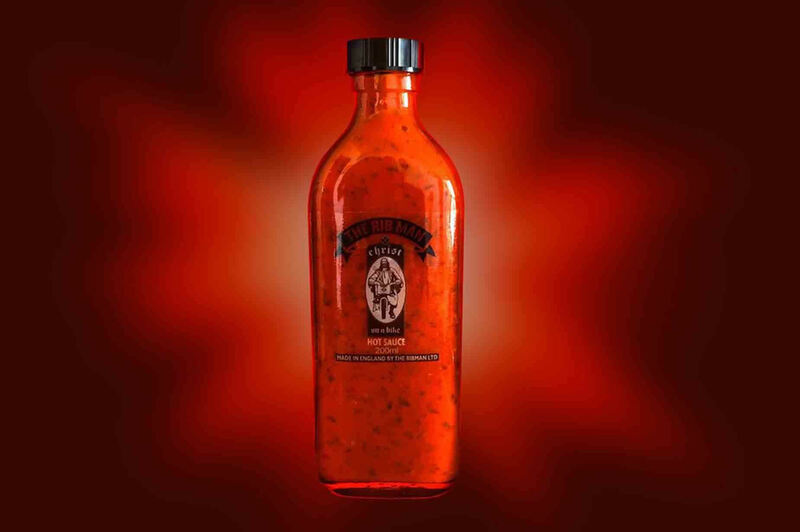 I started by cooking the sauce on the stall and asking customers feedback I kept tweaking the recipe until it was the best hot sauce I have ever tasted - anywhere. 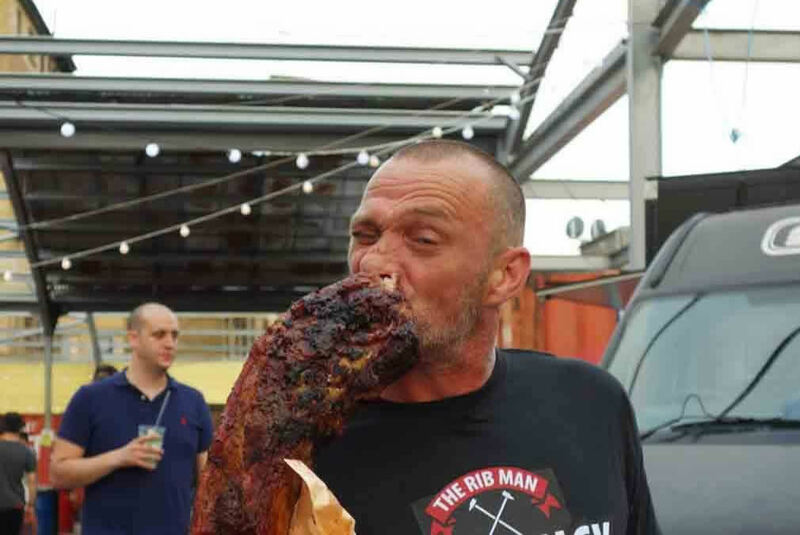 The Ribman has grown steadily over the years. Did you ever think your business would get as big as it has? 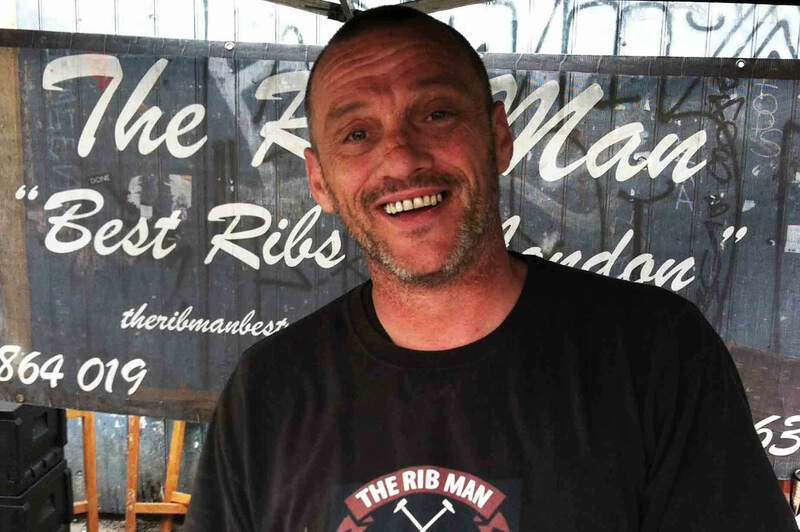 The Ribman has grown steadily over the years and could probably have grown much quicker but I never wanted a business. I began the stall to keep myself sane after losing my leg above the knee. After a few years, it's become clear that I've been kidding myself and a future for The Ribman needed a plan - of sorts. What's been the biggest challenges of being a street food vendor? What drives you on? The biggest challenges for a street food trader are - finding a great pitch, finding your USP, dealing with bad weather and handling bad event organisers and extortionate rents. For me, the thing that drives me on is my family. My beautiful loving wife of 23 years Carolina just makes me want to be a better man every day and my 3 children who are very bright and very funny get to see a work ethic from a one-legged man. I am hoping I can inspire them in some way. What's the process like when it comes to coming up with a new sauce? Have you ever created a sauce that is literally too hot? Every time a new super-hot chilli comes out I make a hot sauce with it - one was so hot you hallucinated but I don't think it was too hot. What's your kitchen like? How long do you spend in there a week? My kitchen is a converted shipping container that I did through a Kickstarter project. It's awesome; insulated stainless steel walls and ceiling, running water, electricity, ventilation and a walk-in fridge! The beauty of my kitchen is that it comes with me wherever I want to set up my HQ - we are now at Truman's Brewery near the West Ham stadium, which is handy. How is your kitchen now different to the one that you started in? The "kitchen" I started in was also a shipping container - but just that - a shipping container with a table and a gas ring. Do you have to create the right atmosphere to come up with hot sauce? I think the atmosphere is very important when making a hot sauce - that's why I love to bang out a bit of old school or some Tupac or Biggie. When you're happy in what you do, it helps. "That's why I love to bang out a bit of old school or some Tupac or Biggie. When you're happy in what you do, it helps." How do you make the best use of your space? How do you go about finding and storing all your ingredients? I would say that the best use of the space is the fact it can come with me anywhere in the world - I mean, I could set up on a beach in Jamaica if I wanted to. Finding the best suppliers for my ingredients took a little while but have been using the same ones for around 8-9 years now. Storing isn't a problem when you have a walk-in fridge. Is it more important for a workplace to be functional or inspirational? I think it is more important for the workplace to be functional - we should look inside ourselves and others for inspiration. What's the most rewarding thing about selling street food? The most rewarding thing about street food is the customer's satisfaction. When people are happy and loving my food, I'm happy. Is there one item or tool that would make your life easier? The one item that would make my life easier? I'd have to say a jet pack. If there's a company out there who want to sponsor 'The Flying Ribman'; give me a shout.